Urinary calculus is a stone-like body composed of urinary salts bound together by a colloid matrix of organic materials. It consists of a nucleus around which concentric layers of urinary salts are deposited. Acute passage of a kidney stone from the renal pelvis through the ureter gives rise to pain at times so excruciating that it has been likened to the discomfort of childbirth. Most calculi arise in the kidney when urine becomes supersaturated with a salt that is capable of forming solid crystals. Symptoms arise as these calculi become impacted within the ureter as they pass toward the urinary bladder. The formation of the 4 basic chemical types of renal calculi is associated with more than 20 underlying etiologies. Stone analysis, together with serum and 24-hour urine metabolic evaluation, can identify an etiology in more than 95% of patients. Specific therapy can result in a remission rate of more than 80% and can decrease the individual recurrence rate by 90%. Therefore, emergency physicians should stress the importance of urologic follow-up, especially in patients with recurrent stones, solitary kidneys, or previous kidney or stone surgery and in all children. The lifetime prevalence of nephrolithiasis is approximately 12% for men and 7% for women in the United States. Recurrence rates after the first stone episode are 14%, 35%, and 52% at 1, 5, and 10 years, respectively. 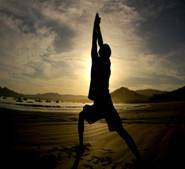 Yoga is a science as well an art of healthy living physically, mentally, morally and spiritually. Yoga is not a religion; it is a philosophy of life based on certain psychological facts and it aims at the development of a perfect balance between the body and the mind that permits union with the divine i.e. perfect harmony between the individual and the cosmos. Yoga cleansing techniques is the best known preventive measures to tackle the occurrence of kidney stones. One of the main causes of kidney stones is lack of water or hydration in the body. Lack of water during the day and over a period of time causes the buildup of deposits in the kidneys - in the absence of the right amount of water to flush out the toxins from the body. In yoga, body cleansing is a highly important part of any prevention or curative program. It is important to drink eight glasses of water, minimum, every day to dilute the urine and prevent the formation of kidney stones. Shavasana is relaxation of body and mind in the position of lying on the back. This asana helps in relaxing mind and body and helps in restoring energy. It is a relaxing posture intended to rejuvenate one's body, mind and spirit. While shavasana is a good way to reduce stress and tension it is not recommended for meditation as it has a tendency to induce sleepiness. • First of all, you need to sit in the Dandasana. Sit flat on the ground, with your back straight and your legs stretched out in the front. • Bend you knees lightly and then gradually lean back onto your elbows, in the process lying down evenly along your spine. • When your back is parallel to the floor, straighten out the legs as well. Moving one of the legs at a time, carefully place them on the floor. Try to place your legs the center of the back of the thighs and calves. • Start to relax slowly, first letting your feet fall out to the sides and then, turning your arms outwards. Rest the arms, on your sides, in such a way that the palms face up. • Stretch the back of your neck and try to rest your head on the center of the back of the scull. Now, draw your shoulders away from your ears and let them fall back in a comfortable position. • Close your eyes and take several deep breaths, feeling your body become relaxed and the tension go away. • Let go of your body completely and allow your breath to become soft, regular and quiet. • Aiming at one of the parts of your body, let it begin to relax and then move to the other parts. • At the end of the asana, stop relaxing consciously and let you body remain in the peaceful mode, for a few minutes. Matsya in Sanskrit means fish. One immediately identifies this asana with the figurative relevance like any other hatha asanas. But here the asana is suggestive of the quality of floating like a fish - a state that's induced by assuming this posture.MatsyasanaTraditional texts state that Matsyasana is the "destroyer of all diseases." This asana is therapeutically helpful in constipation, respiratory faculties, fatigue and anxiety. It's also good for preventing mildly recurring backaches before they go worse. • Assume padmasana If it is difficult, assume a comparable posture (Swasthikasana or Sukhasana). • Bend backwards and touch the ground with the back of your head while not changing the position of your legs. • Use hands to give support to body so that your body doesn't fall flat. While you lay backwards while keeping the legs as in padmasana, your body assumes the same of a fish, with the legs forming the tailfins. The back, shoulders, neck, most part of head and parts below knee will not touch the ground. • Now extend your hands and grasp your big toes. Right hand grasps left big toe, which is on the left side of the body. • Breathe slowly while in Matsyasana pose. • Take hands backwards and place them on the ground as a support. Slowly raise your head and come to Padmasana pose. Vajrasana makes the body exceptionally strong and healthy. Vajra means thunderbolt in Sanskrit. During this asana, feel the sensations in the body as you move them. Do the Movement slowly and in a relaxed manner. Inhale and exhale slowly. While drawing the abdominal region inwards and expanding the chest, focus the attention on these body parts. The way the muscles move must be felt. Relax before, during and after the yoga posture. • With knees, ankles and big toes touching the ground, take a kneeling position. • One should sit on the heels and place palms on the knees. • The Spine should be erect and breath should be deep. • Draw the abdominal region inside and expand the chest.